Expectations were high for the Miami Dolphins entering the 2003 season. A late-season letdown in 2002 and a loss to the New England Patriots in the season finale kept Miami from a second division title in three years and a third straight playoff appearance. With running back Ricky Williams in his second season in Miami and coming off a franchise-record 1,853 yards rushing and 16 touchdowns, many believed that 2003 would be the Dolphins' year. The Dolphins were also stacked on defense with stars like defensive end Jason Taylor, linebacker Zach Thomas and the cornerback duo of Sam Madison and Patrick Surtain. Miami had even upgraded an already stellar defense in the offseason with the additions of future Hall of Fame linebacker Junior Seau and former Pro Bowl safety Sammy Knight. 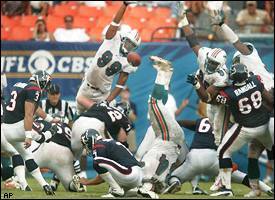 The Dolphins were set to open the 2003 season at home against the Houston Texans, a team in its second year in existence. The Texans had won just four games in their inaugural season and the expectations weren't high for 2003. Miami came into the contest as a 14-point favorite and at the time, the Dolphins had the league's longest opening day winning streak at 12. While number 13 seemed like a sure thing, it was far from the case that day. Houston jumped to a 6-0 lead, but a pair of touchdown passes by Miami's Jay Fielder in the second quarter gave the Dolphins a 14-6 lead at the break. The Texans scored nine points in the third quarter on a long touchdown pass from David Carr to Corey Bradford and the third field goal of the day from Kris Brown to grab a 15-14 lead after three. Miami answered with 12:24 to play in the final period on Jay Fiedler's third touchdown pass of the day, a 35-yard toss to Williams. The score put Miami up 20-15, but the two-point conversion was failed. After Brown's fourth field goal of the day made it 20-18 with 4:55 to play, Fiedler threw his second interception of the day which proved to be the most costly. Fiedler was intercepted by Marcus Coleman, also his second pick of the day, at Miami's 36-yard-line with under three minutes to play. It took Houston seven plays to reach Miami's 18-yard-line before Brown knocked home his fifth field goal with 25 seconds remaining which gave the Texans a 21-20 lead and the eventual victory. The season that began with such high hopes started with an unthinkable loss for the Dolphins. The game however, did serve as a wake-up call as Miami won each of its next four games by double figures. That season, Miami finished 10-6 to notch their seventh straight winning season. Unfortunately, the Dolphins fell one win shy of the playoffs and the opening loss to Houston would turn out to be the one that slipped away. The Texans finished just 5-11 that season, but improved to 2-0 in season openers. To this day, they remain the only NFL team that the Miami Dolphins have yet to defeat.